Aside from smoothies and vegan overnight oats, raw buckwheat porridge is a breakfast staple in my morning rotation. I love breakfasts that are quick and easy and this one surely fits the bill. Similar to smoothies and overnight oats, you can also make buckwheat porridge the night before and store it in the fridge. Throw it into a jar and grab it while running out the door in the morning! How easy is that? 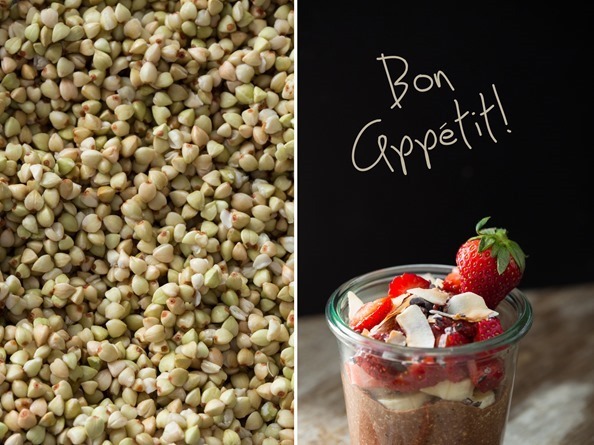 But first – what the heck are raw buckwheat groats? I’ve talked a lot about buckwheat groats on this blog over the years, but it’s always nice to have a little ingredient refresher. Unlike the name, buckwheat is not a wheat product. It’s actually a fruit seed related to rhubarb and sorrel and it’s naturally gluten-free. Beige and pale green in color, raw buckwheat groats are a great source of protein, fiber, manganese, and magnesium. Be sure not to confuse them with kasha which is toasted buckwheat. Kasha has a stronger, earthier flavour and I much prefer the neutral flavour of raw buckwheat groats. You can find raw buckwheat groats in the bulk food section of Whole Foods, natural food stores, and online. I usually buy it by the 10 pound bag from Upaya Naturals website and the bag lasts for-eva. To make this porridge, all you do is soak raw buckwheat groats in water overnight (or for at least 2 hours). Soaking buckwheat helps the body digest it better (and it also softens it, making it easier to blend up and chew). After soaking, rinse it off very well and then process it into a delicious raw porridge. Just like smoothies or vegan overnight oats, the flavour options for this are endless! This time, I was in a major chocolate hazelnut mood, so I decided to turn my breakfast into this chocolaty delight…and it did NOT disappoint! This chocolate porridge is light and healthy without being overly sweet, so it's something you can enjoy in the morning. I added a banana for natural sweetness, a couple tablespoons of cacao powder, and a hint of vanilla and maple syrup. The porridge is great all on its own, but if you want to get fancy, go to town with the toppings. I added toasted hazelnuts, toasted flaked coconut, banana and strawberries, strawberry chia seed jam (from my cookbook), and my homemade vegan nutella. Place buckwheat groats into a bowl and cover with water. Soak overnight or for at least 2 hours. Rinse and drain the buckwheat thoroughly to remove the gelatinous coating that forms while soaking. Set aside 1/4 cup of buckwheat groats so you can stir it into the porridge later on (this gives it a slightly crunchy texture). Place all the porridge ingredients (except for the reserved 1/4 cup groats) into a food processor (or blender) and process (blend) the mixture until combined. I don't process it super smooth as I like a bit of texture to it, but it's your call. Adjust sweetness to taste. Stir in the reserved 1/4 cup of groats. You can chill it for a couple hours (or overnight) or serve immediately. In a glass, layer the porridge along with your desired toppings. Or simply serve it up in a bowl. * Nutrition data is approximate and is for informational purposes only. To make the Homemade Vegan Nutella, see this post. To make this recipe nut-free, swap a nut-free milk for the almond milk (such as coconut milk). Omit the hazelnuts. To save time in the morning, make this the night before. Layer it up in a jar and screw on the lid for a portable breakfast! I wanted to share my excitement about some cookbook news that I received this week. I heard from my editors regarding our official first week of sales (the numbers come from Bookscan and Booknet). Last week, The Oh She Glows Cookbook was the #1 best-selling cookbook in the US, as well as the 4th best-selling trade paperback book in the US overall. Here in Canada, it was the bestselling cookbook, as well as the #3 bestselling non-fiction book overall. I am completely over the moon with gratitude and I can’t thank you enough for all your support. 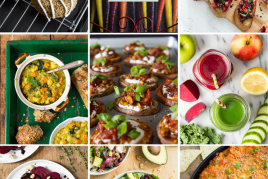 Thank you for welcoming my recipes in your home, sharing the book with others, and spreading the word that vegan recipes can be both delicious and good for you all at once. I really feel like it’s a dream come true. I love buckwheat groats! I eat them every morning but never thought to blend them up like this! Will have to try! You can still watch the Canada AM video (it’s linked on my book page near the bottom under TV appearances. Hope this helps! Congrats on all the great book sales! I bought another copy for my sister who’s birthday we’re celebrating today! I turned her on to your blog and I know she will be SO excited to get the book! Thanks Kaila – I hope your sis enjoys it! I have to get me some buckwheat groats! I swear, I don’t know how you do it with your gorgeous photography, I want to eat to lick the computer monitor! (and your Canadian? I love you even more now!) Girlfriend, you deserve all the success and credit you are getting! Congrats!! That is amazing news. I’m going to have to pick up a copy :) Love the sound of this recipe too, as usual! I think I’m going to make this for the Mr. He’s a nutella and strawberry freak so this is right up his alley. Oops, here he comes…act normal. Congratulations!! Though I can’t say I’m surprised, I’ve been impressing vegans and omnivores alike with your recipes for over a year. The Glow must be spreading! just read the cookbook news – WOW – CONGRATULATIONS!!!! You so deserve it! The day I got my book in the mail, I told my husband that you have a special gift – a light – that comes thru in all you do. You truly are blessed and we are fortunate to receive all that you share. Thank you for your open heart, your generous spirit and of course your photographic and culinary perfection! Thank you, Suzanne. I’m so grateful for your support! I haven’t tried the porridge heated up but I can’t see why it wouldn’t be good too. Let me know if you try it out! I like to think of this as “pudding” not “porridge”. I just made it and I can’t get enough! Thanks, Angela. And congrats! Congrats Angela ! I love this porridge now I gotta go get me some buckwheat groats! He’s in great spirits and back to his crazy self. Also, eating lots which is great because he lost a lot of weight over the past several months. Congrats on the amazing cookbook news Angela! You deserve all the success. All the recipes I’ve made from the book have been to die for and I plan on buying several more copies for friends! Thanks so much for all of your wonderful work, have been following your blog for ages and when I found out you were publishing a cookbook I commented that I don’t buy cookbooks, but yours I would buy! One of my yoga students kindly purchased it for me! And in speaking with one of her friends, another food blogger that apparently is also a friend of yours, she passed on my story of “never buying cooking books but yours” and the friend-in-common passed the story on to you… Love the six-degrees of separation foodies live within! This looks like my kind of breakfast! 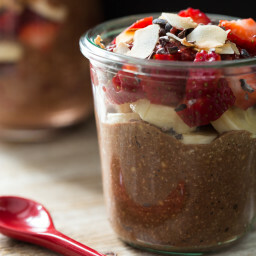 :) I might make this with regular oats–the combination of chocolate hazelnut + strawberry chia jam just sounds delicious, especially with the warmer weather finally around the corner. Congratulations! My husband and I love the book and have been making recipes from it all week. Delicious!! That looks delicious. I really need to start to diversify my breakfasts to include some of these overnight recipes. I’ve done them before and love them, but never think of preparing them the night before, hah. Congrats on the book sales, it must be so exciting! Yum! What a great way to use buckwheat, and I love that you can top it with a bunch of different things. Also, I have been loving your new cookbook. What an amazing accomplishment! Congrats! Anyone can write a cookbook, but it takes someone special to create recipes that become family favourites. I’ve made your guacamole three times this week. I usually put mango in mine (something I discovered on a trip to Tuscon), but strawberries bring it to a whole new level. YUM. Oh glad to hear you are enjoying the guac!! I think I need to put it on the menu this weekend. :) It’s a great late winter/spring recipe! I am so sad I saw this recipe at 7:30 am now have to wait 24 hours to eat it! We are loving your cookbook in our house, the avocado cream sauce on the enchiladas was a particular hit, ummm maybe I’ll have that for breakfast. Pretty much every day since it arrived your recipes have made it onto our plates at one meal or another! I particularly liked the tea and had it last night as a dessert. Thank you! I would totally support the avocado cream sauce for breakfast…it would be great over the savory oats actually! Thanks for your kind words about the book. We tried it and loved it. Was perfect before my morning dog walk. Next time I think I’ll blend it the day before so we can eat and run. Am imagining a chocolate-almond-cherry version already! Thanks! Congratulations! You deserve it – it is a great book!! Congrats Angela! I’m so glad after following your blog I now have a print version to swoon over! PS- Do my photos look extra moody today??? haha. I may have whipped out the black board just for you! YES! I totally noticed and meant to ask if you found a black umbrella, haha. :) Love that 2nd photo especially! I bought your cookbook and absolutely LOVE it! It feels like Christmas every day as I have been cooking my way through it. Amazing job!!! This looks insaaaane I love the look of this recipe! Just made it this morning (fortunately I had some raw buckwheat soaking overnight in my fridge) and it is really good. The chia seed jam goes really well with it (made a combination of strawberries, blueberries and raspberries!). Planning on making the vegan notella soon! btw- Love our book, I have easily made close to 20 recipes and all of the are a hit. I’m so excited for you! Congratulations!! I love the cookbook and have made several of the recipes. In fact it’s time for Apple Pie Oatmeal for breakfast again. Tomorrow I think I’ll try this new recipe from your post. I’ve long recommended your blog as my favorite vegan recipe source and I’m so glad you did a cookbook. Thanks! Awesome book news! How is Sketchie? Congratulations on all your cookbook success!!!! You are truly an inspiration! I have recommended your blog to so many friends and family members. Your blog is amazing and your cookbook is phenomenal!! Congrats on everything!!!! Oh my, how beautiful is this… fantastic breakfast! Great press today in the well + Good nyc email, see the link blow. Congrats! Yay!! I am so so SO happy for you. I love your blog so much and I am so thrilled for you! It should be #1! A healthy cookbook! Who would pass that up! By the way this recipe looks deadly! Can’t wait to try it!! Angela, I am an emotional hot mess! The news you have shared about the success of your cookbook (although, not surprising :) ) had me welling up. Even now I am choking back tears. I have only commented once before but have been reading your blog everyday since March of 2011. It was here that I made the decision to become vegan and dedicated my life to my families nourishment. You have touched many and we truly share in your success. Thank-you! Now, if only my book would hurry up and get here! Beautiful recipe! Ok, so for the impatient folks out there (read: me), is there anyway around the overnight soak or that’s paramount? Congratulations on the book sales! Your photos on this blog are SPECTACULAR, by the way! Wow! How very exciting! Congratulations on your very much-deserved success. You totally deserve all the praise for the cookbook. I’m definitely buying a few copies as gifts for people this year, to show them that vegan food can be delicious and healthy and not overwhelming to make. The photographs are stunning and it’s obvious a lot of work went into this! That being said, I love mine and can’t wait to make everything–especially the nacho dip! Congrats Angela! Congrats Angela! Your cookbook is absolutely phenomenal – I haven;t had a lot of time to try many of the recipes yet, but I have made your doughnuts twice ;) It is a truly beautiful book – your photos, your heart, and your recipes. I have my first book coming out later this year and I can only hope it will be NEARLY as beautiful. Congratulations Angela on your book success – you recipes, positivity and vegan lifestyle is truly an inspiration to us all! This recipe really makes me want to try buckwheat groats asap! This looks like such a delicious and heart breaky :) Thx for another beautiful recipe! I’m loving the cookbook so far! I’m allergic to bananas (weird, yes) though – any suggestion for a substitute for this and the smoothie recipes that have bananas? Hi Julie, you can skip the banana and just sweeten to taste if you’d like. Or you can experiment with other fruit like pears or pitted dates. congratulations on the success of your book launch that your readers knew would happen. Numero uno and for a VEGAN cookbook no less (speaks volumes).That can only mean that you will get another offer for a second book in the future…. This is only the beginning…. How lucky for all of us! I don’t normally buy books and have NEVER purchased a cookbook but I just had to buy 2 copies of yours! One for me and one as a gift and I’m still pondering possibly getting my hands on a couple more copies for gifts. It is a beautiful cookbook and I am very excited to work my way through it. I am so happy to hear of your success! I also rarely purchase cookbooks but I had to have hers. First of all, CONGRATULATIONS on your cookbook! I must say, I’m not surprised. Your blog is one of the most beautiful blogs (and not just in the vegan world, or the health and wellness world, but simply in general) I’ve ever seen or followed. Your recipes and all your photographs are incredible. Secondly, this looks like heaven. I have a question, though. Do you HAVE to blend raw buckwheat groats after soaking them? Have you ever eaten them as porridge without blending? This particular recipe might not come together as well without blending, but I’m curious if I could just soak and rinse them, and then top them with banana and maple syrup or something. 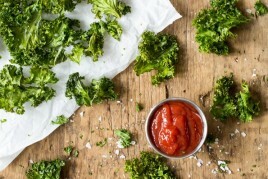 Your blog was the first vegan blog I came across when trying out a new way of eating. Like you, I suffered from an eating disorder for years! Thank you for being an inspiration to those of us who have been through a disorder, and showing those that still suffer that there is a way to enjoy great tasting food that nourishes our bodies. I was so excited when I got your book I read it cover to cover that day! Congratulations on all the success with your book and I hope you have many more successes through the years!! Congratulations on your success and this huge milestone in your life! You are such an inspiration. I’m beyond excited to get my copy of the book (should be here on March 20). Your fans love you! Congrats on all the success!! I’m so excited to hear how well the book is doing – that’s amazing! first that parfait looks gorgeous! and second super congratulations on the book news. i have been hearing only rave reviews! Super awesome on the book news, congrats! I would totally start the morning with this, sounds delicious and love that it is gluten free! So…the cookbook. OMG, I have finally found the granola bar recipe I have been looking for all these years. Thank you! This week I’ve made the Tex Mex Casserole, Chana Masala, and Red Lentil Kale Soup. They’ve all met with great reviews from my family (I always ask them to rank the recipes I make on a scale of 1 to 10 – you got 9s and up). Thank you! And also, I love how your personality really shines through in the cookbook writing. You’re a woman on a mission to share her passion, and you’re also funny and humble too. Perfect mix! Congratulations Angela! You deserve it after all of your hard work. I came onto your site to get a pancake recipe for my breakfast tomorrow and this caught my eye. Pancakes can wait because this looks amazing! Love this, Angela! Buckwheat is one of my very favorite breakfast ingredients. I think it’s so earthy – but very importantly, keeps me full and energized for a long time! Perfect for someone like me who burns and then crashes from carbs so quickly. Love your hazelnut take – especially how it is still so healthy! This looks really good. Angela have you ever made buckwheat groat tacos? They’re wonderful – after soaking the groats, stir fry in a pan with onion garlic and other taco type seasonings – like cumin and a bit of chile powder. Fill your taco shells then top with salsa, cabbage and some Daiya – they’re amazing. I’ve also used buckwheat groats for my “ground beef” in chile – awesome. Oooooh CONGRATULATIONS ANGE!!! That is such brilliant news! Although I have to say, I had a feeling it might happen – the book is BEAUTIFUL! As for the recipe, I’ve been meaning to start cooking more with buckwheat groats since I found out about my gluten sensitivity, so thanks for the reminder. This sounds like a perfect way to get started! Congrats on such an awesome book! I’ve enjoyed making and eating a few recipes from it already. Your glo bars are so yummy! The sweet potato black bean enchilades were delish. I can’t wait to try the smoothies…they all look spectacular. Thanks for all your efforts in not only making great recipes and fantastic photos but for inspiring a meat eater like myself to be excited about Vegan meals more often. Yippee! I’m so excited & happy for you Angela. You are doing A-MAZING work with your cookbook & it thrills me to know so many more people are enjoying the goodness of compassionate, healthful meals because of you. Again, so, so happy for you. I’m a new believer in buckwheat & excited to see a new way to use it. Looks absolutely delish. You’re amazing! I can’t wait to get to my parents house where I accidentally sent the book!!! I have never had buckwheat groats but your picture makes me want to run to the store right now and get some. Congrats on the cookbook, I am loving my copy and am always telling people about your website. I always receive rave reviews on my leftovers that smell so good at work the next day and it’s my opportunity to tell people where I get the recipes from and to let them know you now have a cookbook. So excited for you. Congratulations on the cookbook! I hope it does wonderfully for you. What a delicious looking recipe and so healthy! Well, I am not surprised. The cookbook is great, mine arrived Wednesday and we have already made two recipes! The timing is great, too; we are close to vegan most of the time (darn eggs, so hard to quit…) but during Lent completely so & in desperate need of new recipes! The nacho dip is amazing! Better than anticipated & I even ate some cold tonight. It’s really good cold on crackers! This recipe looks soooo good. Congrats on your cook book and blog – your photos are so incredible. Such an inspiration!! Congrats on the cookbook! I received one and gave one to a friend. The tomato soup is great! Can’t wait to try more recipes! Congratulations on the book sales! I am working my way through the recipes. They are really, really good! And the pictures are so beautiful. I also saw you in the April issue of Chatelaine. Way to go Angela! Angela – congratulations! Your book continues to be my everyday read. And cooking guide! You inspire and bring such goodness to all of us. I can’t express enough my gratitude for sharing all of your recipes and posts. Hugs to Sketchie. Thanks for being so creative Angela!! Congrats on your sales!! What an accomplishment! I received two of your cookbooks for my birthday last week!!! (Absolutely gorgeous cookbook and I am so excited to try so many of your yummy recipes! ) and yes – I will regift one of the books to make one of my sisters just as happy as I am ! Congrats on the cookbook–how awesome is that?!!! This parfait also looks amazing. Wow. I picked up your cookbook from Coles a couple of days ago. I had pre-ordered so I could get the e-sampler as well. The lady at Coles looked at the title and asked if it was a book about hot flashes!!! Oh She Glows. That totally cracked me up. Apparently she suffers from them quite a bit. So I told her to buy the book, it couldn’t hurt. I am enjoying the book, and I am looking at today’s buckwheat groats recipe and thinking I may have to try that as well. Keep up the good work, I love to see your email in my inbox. haha that’s too funny! Thanks for picking up the book, I hope you enjoy many recipes to come! Happy cooking. Your cookbook is amazing. I receives it Tuesday and used it that night and again on Wednesday. The tempeh recipe is fabulous! I am so glad you are receiving the credit you deserve! I received your cook book almost 2 weeks ago and I read it all through! Congratulations, the recipes are appealing and the pictures beautiful! Way to go Angela! Been following your blog for a long time and I wish you all the best in your new adventure! Very exciting!!!! Hey just to let you know your cookbook has made it across the pond and has made itself at home with me in the North of England! I already have the Yolos in the freezer (that’s the ones we haven’t already demolished and I plan on making the avocado pasta sauce soon. I’m not a vegan but I just love to read your plant-based recipes. I’ve made a few off your website (the cookie dough balls were a hit at work) and they always work, even though sometimes I have to tweak to find UK ingredients (and something a bit cheaper than maple syrup when you use in by the gallon! It’s expensive here!). Malt extract is a good substitute, I don’t know if you have it in Canada? Thanks for the inspiration – I feel healthier just reading it! And I will have to try the buckwheat porridge – was thinking of giving the one in the book a go tomorrow but the chocolate hazelnut verson looks even better! Thanks for all your support! I’m so happy you are enjoying the recipes and cookbook so far. :) And how exciting to know that it’s over in North England! Very cool. Congratulations! I just received your (pre-ordered) cookbook! I love it. SO many great recipes! Congratulations Angela that is very exciting news! 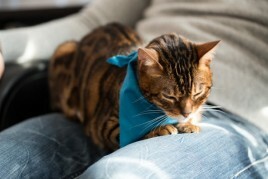 I am also happy to hear that Sketchie is feeling better and eating again, that is fantastic. This breakfast looks lovely. I just recently began eating buckwheat groats as a hot porridge, I will have to try it cold and blended. Love the nutella and chia jam additions. Yum! I love your breakfast parfaits – what a decadent way to start the morning. I’m going to have to try these for my little strawberry (and buckwheat!) -loving toddler! I just wanted to add my congratulations to you on the success of your cookbook – it is very well-deserved! Your homemade rolos alone make you a genuis in my book! :) I saw you on Canada AM and you did so great! You are just as lovely “in person” as I thought you would be! Congratulations on your cookbook success! I just ordered the book and can’t wait to receive it. Just a quick question you had the bundle recipe offer a while back, would you be offering it again or selling it separate? I am pretty sad I missed out on that and I would love to get that as well. I just bought your book at Costco here in Vancouver and have spent this dreary rainy day making Classic Glo Bars! They are TO.DIE. FOR. I will never buy granola bars again for my 3 kid’s lunches. They were so easy to make and so yummy. Your cookbook is beautiful and the recipes are delish. I made the marinated mushrooms last night and had the miso power bowl for lunch yesterday. By the end of the week, I hope I am glowing too! Cograts on a great book Angela. I love it. Love your website and I am excited I ordered your book! Congrats. You have done a great job inspiring us newbe vegans. I am not sure I could have made this great adventure of becoming a vegan without the such great ideas and information! Wonderful news – thank you so much! Congratulations Angela! I’ve been seeing your cookbook popping up on my girlfriends’ coffee tables. It is beautiful, a foodie work of art!! And it seems every party I go to has at least one delicious recipe from ohsheglows. The success is well-deserved after all of your hard work over the years!! Looks delicious– making this tomorrow! Thanks for all of your awesome recipes; I love them all! Could you make this without bananas? Yes you certainly can – just adjust the sweetness as needed. Hope this helps! That’s amazing about the cookbook sales! Just received my copy (and several extras as gifts for friends!) – loved the introduction and beautiful food photos. Not only are your recipes delicious, your whole approach to food makes me feel good about life in general! It is like beautiful artwork full of not just flavors but passion! Just picked up the cookbook last weekend – I couldn’t wait. I’ve made two things so far and am making the vegetable curry tonight. It’s a beautiful book, congratulations. I hope it’s the first of many! I bought your cookbook yesterday and already made two recipes! I just wanted to say that your cookbook is absolutely amazing. I love it! And I think you are amazing too – a very very inspiring woman. Good luck with all that you do. And thank you for doing all that you do. I got your cookbook a few days ago and I can’t get over how beautiful it is and how much I love it! I’m planning to buy more copies to give as gifts to friends. Congratulations on a job very well done, and I’m so glad I came across your blog a few months ago! Your are truly an inspiration in so many ways. Your cookbook just arrived I was actually grateful for a four hour ride in the car this past weekend so I could devour it from cover to cover. I “entertained” my husband for hours reading the recipes while he drove. :) I am nearly 63 years old and have been following your blog for approximately 2 years. I enjoy it tremendously and have recommended it to my daughters and friends. Your recipe for overnight oats was the first thing I tried and it has become my go-to breakfast. Green monsters are a close second. My goal now is to try each and every one of the recipes in your book and incorporate my favorites in my regular meal rotation. My husband is always asking me why I keep trying new recipes instead of sticking with the “tried and true”, but with your recipes looking and sounding so wonderful, how can I resist? Congratulations, Angela and I wish you continued success! Thank you so much for your lovely words about my book! I appreciate it so much and I’m thrilled you are enjoying it so far. Thanks for all your support! I have referred several people who are looking to add more meatless meals to both the blog and the cookbook. Nothing better out there, period. Love this idea! Buckwheat groats are new for me, so I’ll have to look further into it, but breakfast on the run is me all over. Chia seed pudding and overnight oats are regulars. I bought your book. Can’t wait to start cooking. Thanks and congrats! Ok, this looks/sounds like my PERFECT breakfast. And OMG, the NUMBER ONE best-selling cookbook in the US?! Angela. You’re astounding. Nothing to be surprised about, because the book is amazing but I am so proud of you. Keep doing amazing things, my love!!! And I will definitely be making this breakfast ASAP. This looks and sounds delicious! Do you think this would work with chia seeds for a chia seed pudding? I’d never heard of buckwheat groats but now I am really curious to try it! It looks like a dessert and with the jam it sounds like heaven. I can’t wait to try this! I’ve been following your blog for years, and in this my first post-college year, your recipes have been a godsend when I’ve suddenly found myself back in my parents’ house with their sometimes questionable eating habits (‘What? We had a *vegetarian* dinner, doesn’t that mean it negates the half of a cake we’re about it ear?”). When I got my copy of the cookbook I squealed with delight. “Yay, Angela! !” I explained to my mom that even though we’ve never met, and likely never will, how happy I was for you that you’ve had this great success. Congrats many times over, Angela! CONGRATS on the book sales, Angela! :) :) I am more than excited to get my copy in the mail this week from Amazon. 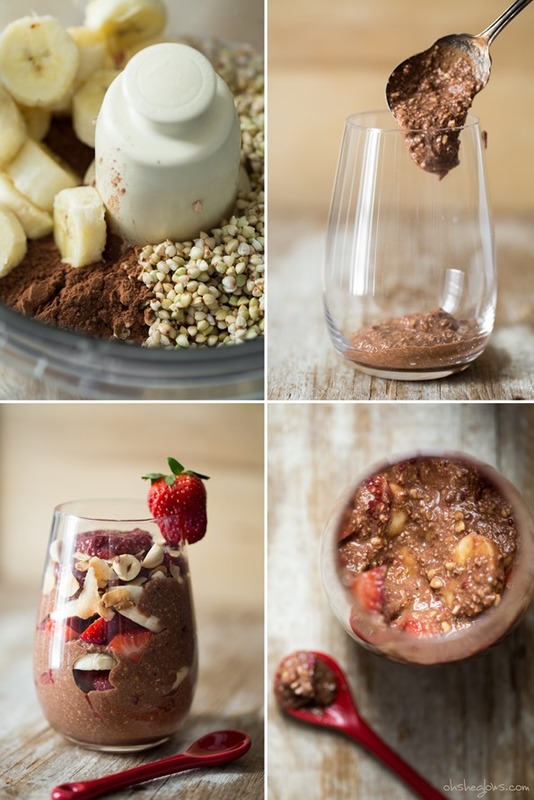 Andddd…this breakfast parfait just might have to happen this week in my house. Looks scrumptious. Love these recipes so much! Thank you! I just found your blog and am so excited to have done so. My daughter was recently diagnosed with severe food allergies which has left me in a constant search for vegan gluten free recipes and trying to understand some new ways of cooking and eating. I am very excited to explore your archives. This parfait looks amazing, she would be one happy girl to wake up to this! These look great, can’t wait to try them at the weekend. I made some Vegan Nanaimo bars from a recipe over on greedyvegangirl.com yesterday, so got to get through them first! They are delicious also!! So excited to hear about how well your cookbook is doing! You are more than deserving of it! I can’t wait to try this recipe! It looks amazing! p.s. I have been sending positive thoughts to sketchie. Hope he is feeling better! Wow! So well-deserved. I’ve been enjoying my book so much! You’re a household name now with my family and close friends. And this recipe looks incredible! Congratulations on the book – I can’t wait to hear all about it! I need to make this A.S.A.P. – yummy! Not shocked on the cookbook news – I have read you for years, pre ordered the book, and as of tonight have made three recipes! It is one of the very best vegan cookbooks that I have had. The cashew curry was the first great curry I made, and the tex mex casserole (there should have been a spicy warning!) is now going to be a staple. Thank you for sharing! Hi! I’ve been lurking on your site and love it! I got your cookbook for me and gave one to my Mom, who is vegan. I tried the overnight oats and they were awesome! I ate for breakfast and lunch! I’m not vegan, but am incorporating more plant based recipes into my diet. The cookbook definitely helps. Keep up the great work and congrats on all your success! Truly inspirational! Angela, congratulations on your book’s success! It is so lovely. Your photography is inspiring and I love that there is a photo for every recipe. There are so many recipes that I want to try! Dear Angela, I got my book and I have to say is beautiful, I have tried several recipes already and made this buckwheat parfait , all of the recipes are delicious , no wonder your book is number one!!! Congratulations ! You are amazing . Congrats on the book!! Very exciting!! I just had a question about the ingredients of the porridge. Could I use roasted buckwheat groats?? Also, there is no hazelnuts in the porridge. Maybe it would compromise the taste?? Angela, I tried the roasted buckwheat at my friends. Now I know they could not work for this recipe. I made this recipe this morning. It was delicious and satisfying. Made this and all I can say is WOW!!! I love it so much I have had it 3 mornings in a row! So delicious that I can definitely say that this will be a weekly meal!!! Thank you so much!!! I’m so happy to hear that Betty! I am not allowed banana due to some medical issues, can u sub. The banana for something else..
i’m not surprised about the success of the cookbook. i haven’t stopped gushing to all my friends and family about it since i bought it! Ok so question for you. I bought buckwheat groats and baked them slowly in the oven a few weeks ago. I believe it was the raw- organic kind. I could NOT stomach them…. I tried really hard… Even one spoonful, I had a hard time swallowing…. so I’m very hesitant to ever buy it again…! Oh I love buckwheat porridge – it is definitely one of my favs as well =) This looks super delicious Angela! Could I swap out steel cut oats? Thanks! Angela, I have a question about raw buckwheat groats. For a while now I have been eating them completely plain, just out of the bag, ie without either toasting or soaking. (Not just by themselves – mixed with yogurt, honey, jelly, fruit, oats, wheat germ etc.) When you recommend soaking them, is that because there are real health benefits to not eating them plain or is it mostly a question of taste? Thanks for your advice! Hi Zeke, I’ve read that buckwheat groats (raw) are difficult for the body to digest, so that is why I soak mine first. I have noticed in the past that I got stomach pains when eating the raw groats without soaking. This looks phenomenal! Question- where did you procure the jar I see in some of the photos?? I have seen this type in other recipes and it Los perfect for so many things, but I can’t seem to find anything like it! I love this breakfast! Have just made a batch to take into work for the rest of the week – topped with raspberries and cacao nibs :) I add a couple of tablespoons of oats and some peanut butter to my boyfriend’s to fill him up! do you think I could substitute bulgar groat for the buckwheat? Just tried this recipe today… soooo good! This is my first official recipe from this site (which I recently discovered…yaay! ), and it turned out great! Thanks so much for your amazing site, your witty humour, and fantastic recipes! I was wondering if there is anything I can substitute the buckwheat with?! This looks AHHHHMAAAZING! I am drooling over it currently. Unfortunately I was a bit disappointed by the blandness of this recipe…meaning, it looks a lot better than it tasted. I would imagine you could sweeten it up with a good drizzle of agave nectar or maple syrup. Probably not the best dish to bring to a brunch with non-vegan girlfriends on a first time trial. Totally forgot the sweetener! 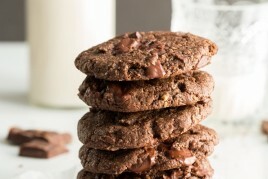 They loved the toppings and texture though…especially the dark chocolate and toasted hazelnuts!